Edward L. Spalding Jr. ’63 died on November 11, 2018, in Kennebunkport, Maine. Ed Spalding passed away November 11, 2018, at home surrounded by his wife, children, sister, and devoted dog Scout. Ed is survived by his wife and best friend of thirty-five years Dinorah, son Benjamin, daughter Allegra ’08, sister Mary Marsters and her husband Sandy, and his loving nieces and nephews. He was predeceased by his parents, Edward Sr. and Bertha Spalding, and brother Loring. Ed was born February 4, 1941, in Newburyport, Massachusetts. He grew up in Meriden, New Hampshire, and attended Kimball Union Academy. He spent much of his time reading in the library or at the hockey rink. Ed grew up admiring his father above all, adopting both his father’s modesty and his kind, gentle demeanor. Ed attended Bowdoin College as a government major. He was a member of the Beta Theta Pi fraternity and a captain of the ice hockey team. During his senior year, he was an integral part of the team’s top line, which set the College’s single-season scoring record that held for many years. 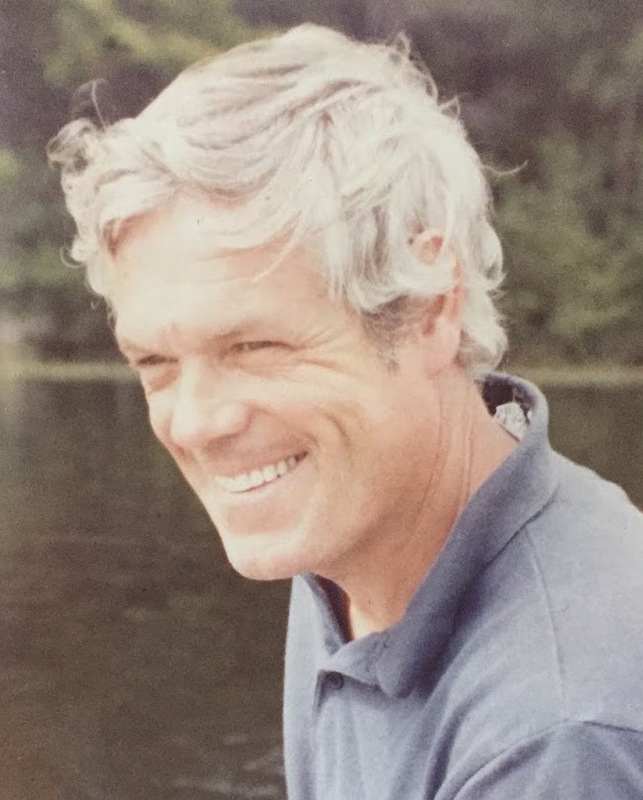 Over the decades, Ed was a regular spectator at Bowdoin hockey games, and was incredibly proud when his daughter decided to follow his footsteps and attend Bowdoin as well, giving him more reasons to visit a school he so loved. After college, Ed played semi-professional hockey for the Lewiston Twins, a “rough group” with a reputation for fighting other teams—and for keeping a refrigerator full of beer in the locker room for before and after games. Ed received his masters in education from USM, and worked as an English teacher in Maine for fifteen years before following his passion for building. He ran his own general contractor business and moved from Maine to New York City after meeting and marrying the love of his life. Ed was dazzled by Dinorah and they exuded a visible adoration for one another throughout their decades of romance. Following the birth of their children, they returned to Kennebunkport. Ed had a deep love for reading and nature. He loved being on the ocean and spending time on his boat at Turbat’s Creek. He loved being outdoors, whether it was playing golf or tending to his garden. But most of all, Ed loved spending time with his family—including the very many dear friends he considered family—and his favorite pastime was walking to Vaughn’s Island at low-tide with his family and dogs. Ed will be remembered as a devoted, loving, and thoughtful husband and father. His kindness was second to none—his ability to soothe his loved ones’ worries admirable, his willingness to forgive others’ faults unflinching. He shared countless laughs with his dry sense of humor and brightened countless rooms with his soft smile, and he carried himself with a grace and dignity that washed over all who encountered him. Ed touched the hearts of many and a celebration of his life will be held in December. Details will be provided by the family when final arrangements have been made. Ed was a year ahead of me at KUA. We lived in the same dorm building on campus…Kilton Hall. Ed Studiously cracked the books in his attic apartment, and we rarely spoke. Ed Senior was one of our favorite faculty members. RIP Ed and Ed. I was a faculty child at KUA. She was also my third grade teacher. As a child living at Kimball Union I was so lucky to be surrounded by such exceptional adults. I am as so honored to have had a visit from Ed’s father some years ago. I remember your family, Ed, as my family does. You will always remembered by the Jones family from Meriden NH. Your parents and brother, Lorie are honored by my family as we live in Newburyport.